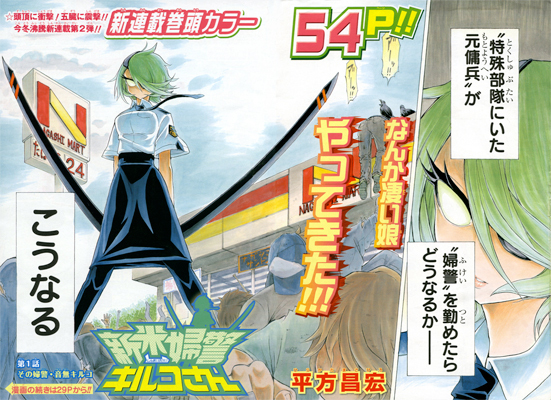 Shinmai Fukei Kiruko-san (Novice Policewoman Kiruko-san) began serialisation in issue 51 of Weekly Shonen Jump. This is a comedy/action manga, so in the same category that Katekyo Hitman Reborn! belonged too. After reading the first chapter of Shinmai Fukei Kiruko-san, I thought it was pretty good chapter. In my personal opinion it could probably beat new series Hungry Joker.